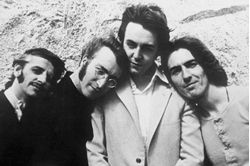 Why The White Album is The Beatles' greatest . Beatles Radio: The Beatles, Solos, Covers, Birthdays, News The Fab 4 and More! Five years ago I stood in a room containing nothing but White Albums. For his installation We Buy White Albums, the Californian artist Rutherford Chang had filled a small gallery in Manhattan with 693 vinyl copies of the ninth Beatles album, some on the walls, some in racks. The sleeve, designed by Pop artist Richard Hamilton, is famously blank but every one of these copies was faded, stained, torn, illustrated, signed or otherwise altered in some unique way, whether by a human hand or simply by the passing of time. As I studied them, I listened to multiple copies of side one playing simultaneously and slowly drifting out of sync, rendering these exceptionally famous songs eerie and strange. There’s something about The White Album that invites listeners to mess around with it. Joan Didion stole its title for her 1979 essay collection, an elegy for the dreams of 1960s California. The producer Danger Mouse chopped it to pieces and recombined the fragments with vocals from Jay-Z’s The Black Album to create his 2004 mash-up The Grey Album. The jam band Phish covered all 30 songs on stage on Halloween night, 1994. Charles Manson, notoriously, had his own theories. Even the title has been rewritten: The Beatles called it The Beatles but their fans had other ideas.